There are many challenges dentists face in taking an impression that can be utilized effectively by the lab. Oftentimes, the list of “what not to do” when it comes to impressions and preps is far more important than the list of what to do, because an improper result can lead to frustrating remakes and a poor relationship with the ceramicist. 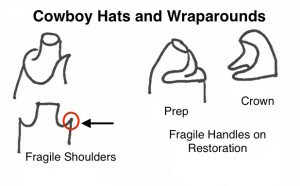 One area that we’ve noticed causes a significant amount of problems is cowboy hats, wraparounds, and fragile shoulders. We’ve included this illustrative graphic to demonstrate what occurs in stone when a common chamfer margin design is prepped with a tapered diamond. What dentists don’t realize is that the result might look great intra-orally, but proves to be challenging to the lab. A spicule of stone all around the perimeter of the die can easily abrade or chip when finishing your all-ceramic restoration. The undesirable effects of this are inaccuracies in margin, overall fit, and finish. The prep that resembles a cowboy hat will not translate precisely in the lab. Fragile shoulders cannot be replicated in a way that supports a perfect fit between prep and crown. Instead of being beholden to the materials used in fabrication, utilize this tip to ensure ultimate restorative success. Preparation design is key in the world of custom ceramic fabrication. When it comes to impressions, a precision-based relationship with the lab can work wonders for improving the quality of the resultant cases. It’s never fun to put in the time and effort on a case and then have to go back and restart the process because of a minor detail. Get more tips to think like a lab in the first two impression challenges in our troubleshooting series, where you can learn about avoiding inaccurate margins due to preparation design and how the disposable triple tray contributes to unnecessary remakes.